What would you do if someone wanted to illegally concrete over your local park, and build an apartment block on it? And what would you do if the authorities supported the illegal construction? Today episode looks at how to organise genuine opposition in a place where the one thing they hate is genuine opposition. How a small protest against destruction of a local park turned into a mass movement that’s sweeping Russia. Click the play button above to stream it here. Or listen to the episode on PodcastOne, Stitcher or Apple iTunes. Or use any Podcast app with our RSS Feed). HOST: (paraphrase) I am in Julia’s kitchen. Its a cute room – rectangular and well decorated. HOST: I was being polite. It was so tiny. The whole apartment was 45 square metres. That’s 480 square feet. HOST: It’s got wallpaper made of fabric with lots of different colours of purple and yellow and green and the wall is covered in plates from all places around the world that Julia’s family has travelled. And I can see out the window that’s the side of the kitchen the beautiful green park where Julia takes her kids to play almost every day. JULIA: So I feed birds here on the window. The birds are different types. There are are very unique. And we also have squirrels nearby in the market. HOST: I’m Amanda Tattersall, and this podcast is supported by Mobilisation Lab they connect social change campaigners with what works. Check them out at MobLab.io. HOST: Today on Changemakers, I’m in Moscow, feeling a bit homesick. Everyone has a special affinity with their own home. But what happens when the authorities where you live think they can do whatever they like to the place that you call home, mainly because, they have a history of getting their way? You fight. Let’s go. HOST: There are 7,900 blocks of apartments like Julia’s in Moscow.. And when I say like, I mean, virtually identical. Five-storey, prefabricated, white painted, concrete rectangles. JULIA: In Russia it is called Khrushchyovka because of the time of its building under Khrushchev, it’s our leader. HOST: Like in the West, Russia had a baby boom after World War Two, but Stalin didn’t do anything about it. Instead, two or three generations of families found themselves crammed into small homes. It felt like that was how it was going to be for the rest of their lives. But when Stalin died, the new leader Krushchev decided that he wanted to be loved not feared, and so he built these apartment blocks for the millions of young families who’d been living with their parents and grandparents. They were a symbol of a new type of leadership. They’re not the most beautiful buildings in the world, but 1.6 million Moscovites are proud to call these brutalist structures their home. Now the Mayor of Moscow – a man named Sergei Sobyanin [So-bi-an] – wants to knock them down. Ideally, all 7,900 of them. In February 2017, he announced plans to demolish 50,000 apartments with more to come. It goes by the benign-sounding policy of renovations, and it’s stirring genuine opposition in a country where the one thing the government hates more than anything is, well, genuine opposition. HOST: Imagine living in one of those apartments. They look drab from the outside, but inside they’re warm, most of them are solidly build. Everyone I talked to said they couldn’t really hear their neighbours through the walls. This was Krushchev’s legacy — under his policy — 25% of Russians got their own homes. It was a mass urbanisation the likes the world had never seen before. So the idea was they were homes for young families. But imagine trying to bring up children in a 45 square metre apartment. Where the hell do the kids play? Like everything else, Soviet planners had, well, a plan for that. INTERVIEWER: Why did you want to live in this area? JULIA: So when we were choosing where to live. I get the map and I searched for the green zones because I wanted to play with my children, to walk in the parks and that’s why we chose this part of Moscow. HOSTS: Parks. Lots of them. Indeed they were called urban forests because these parks had always been there – before Moscow was an established city. In true communist style, everyone’s backyard had been collectivised, clumped together and shared as public space. For years, Julia had heard about the mayor’s renovation plans, but hadn’t thought much about it. But in 2016, she found out that the park next door – the whole reason she was living there – was going to be turned into an apartment block. They were planning to replace the pine forest with another block of units. JULIA: We knew about it almost by chance. Our municipal deputy was mail to the documents so we got information about the, a further construction. HOST: So they had some documents that said it was going ahead. But when Julia enquired about it, the authorities reassured her nothing was happening. JULIA: But our local authorities said us that no such construction would take place. They insisted that no such construction would take place. HOST: Not totally trusting the officials reassurance, together with her local representative, Julia made further inquiries. JULIA: So they said we knew nothing about it. They said it was hardly possible that such a construction will take place. HOST: And yet trucks were moving in. It was clear that construction was about to start taking place. So Julia did what any outraged local resident would do. JULIA: I took pictures and then sended it to the local organization which do the protection of national resources. INTERVIEWER: You contacted your local environment organization. What were they called? JULIA: So it is called Mos… in Russian which means Moscow’s nature and this is an environmental protection organization. And we send them photos and we applied to them when we want to protect something. HOST: But bureaucracy in Moscow is slow. While they waited for the environmental protection organisation to stop the construction, Julia started talking to her neighbours. JULIA: In October I started talking with other families here to protect the park. HOST: It was at that point, Julia discovered she wasn’t alone in wanting to protect her park. JULIA: We live in huge city and if we don’t have any parks here, it would be impossible to raise children here without clean air, without any options to be walking them in the parks. So we found other activists, people with many children. HOST: Meanwhile, the Mayor is not even acknowledging her concerns. When asked about protests against his development plans, he cites a pro-Government thinktank poll which says 80% of Moscovites support his plans. The mainstream media lapped it up. At the same time, everyone in power that Julia talks to assured her nothing would happen to the park. It would illegal to construct anything on the park. After all, the pine forest has been there for hundreds of years. It’s essentially heritage listed. Even the roads leading into the park are illegal to drive on. HOST: Weeks pass. Then one day, signs go up around the park, announcing that construction will begin. In a few days. INTERVIEWER: You’d been told there was no construction then you found the signs. How did you feel? JULIA: I was shocked. I couldn’t believe that such thing is possible in Moscow, in the center of Russia. It was a really shocking thing. HOST: Any uncertainty was now lost. Julia decided to mobilise. How? They set up a Facebook page, of course. JULIA: It is called Let’s Protect Our Park, [21.30] Park. We post photos there, our letters, and we try to attract people attentions in this group. HOST: So they used Facebook to raise awareness. And also place signs in the area so, so let people know what is happening. And we also organized 2 meetings, and 2 protests. INTERVIEWER: How fast was it that other people got involved? JULIA: So initially when the construction started, people around here was shocked. And they supported us and 16,000 people signed our petition. HOST: 16 000. For a local park. Julia says 3-4 thousand of those were offline, with the rest coming through their Facebook group. INTERVIEWER: Why do you think so many people joined the campaign so quickly? JULIA: So it’s really important for us. We all love this place. We have squirrels there, we can feed them in summer. We can ski there in winter. And we have beach there also. It’s amazing, everyone loves it. HOST: That’s right, it’s even got a beach. In Russia. Because Russia is known for its great beaches. Unfortunately, the construction company pushed on. JULIA: And also after that, some people all in black appeared in the park suddenly. And they pushed out the activists who were trying to protect the park. And it was unbelievable. HOST: So Julia decided that if the authorities weren’t going to stop the illegal construction, she and her neighbours needed to take the law into their own hands. INTERVIEWER: How did you that? JULIA: We tried to block the road. HOST: Remember, this is Russia. Where opponents of the Government are regularly assassinated. That said, it was a local issue. Hardly likely to get the notice of the Kremlin. At least, not yet. Julia and her fellow neighbours took turns, blocking the roads from the trucks that were driving to the very active construction site. INTERVIEWER: Before the protests in the park, had you ever been involved in a protest or social change campaign before? INTERVIEWER: So what did it feel like (laughs) to block a road to save your park? JULIA: So it was really stressful and I spent this time with my children and family by the hedge to block the road. INTERVIEWER: How did you do it? JULIA: So its quite silent here and I heard the vehicles going to the construction site once. So 3am we went there, with my husband. HOST: Their neighbours who also lived next to the park joined in. The road they were blocking was through a protected area. Cars weren’t even allowed to use that road, let alone trucks for a construction site. JULIA: So we called the police and we tried to stop the vehicles but against us was about 20 people and we couldn’t do anything. And then the vehicles passed through us … So we asked the police to check the, whether the vehicles are allowed to go there but they didn’t do it. HOST: Then one day about a month after the construction begins, finally, Julia heard back from the environmental protection organisation in charge of stopping illegal construction. The one they’d sent the photos to. JULIA: So. Only one month after the start of construction [Mosk…17.45] gave them the passes that they are allowed to go to the construction site. INTERVIEWER: Oh my god, you lost your ally. They turned, they turned to the other side. That’s a disaster. How did you feel? JULIA: So actually they were not our allies. They changed their side. We tried to account to them but they were…by the side…They were on the side of construction organization. HOST: That’s how it rolls in the land of Putin. Still, they pressed on but when it came to blocking the road. Unfortunately for Julia, time wasn’t on their side, thanks to a very Russian problem. INTERVIEWER: So, so you blocked the road for how long? JULIA: So it was winter. So 24 [27.48] was impossible. And we did it from time to time when we could. HOST: The Russian Winter. Sure, it stopped Napoleon and Hitler, but now it was stopping Julia’s protests. So instead, her group turned their efforts to navigating their way through the Russian bureaucracy, to find an institution or agency that would rule the clearly illegal construction – illegal. They wrote to the Mayor. JULIA: So we got a reply from them that they didn’t see any illegal activities. And actual, actually, the construction is legal. HOST: This was untrue technically, but the mayor was used to doing things that were technically illegal, and getting away with. He had the support of the Kremlin, and perhaps just as importantly, he was popular among Russia’s oligarch’s. The mayor’s attitude was that it was legal if he said it was legal. HOST: So what was going on here? How did the construction companies think they could just barrell in and build an apartment block over a much loved park? Why did the Mayor think he could act with impunity? And what do you do when you’re fighting an opponent who doesn’t stick to the rules? Elena Rusakova is a local activist, who ran in the 2012 regional elections. ELENA: So it’s long ago, in 1990s, probably when local authorities first started to consider these green areas as their own property. HOST: Elena says the problem dates back to the 1990s. Before the collapse of communism, the parks were controlled by the Soviet authorities. They were embedded in the idea of collective ownership. The idea that they could be privatised was anathema to the whole system. But then, when the iron curtain came down, the question of who even owned these spaces, who was in charge of the parks, became a genuine puzzle. So, even though there was never any formal decision to make them the property of the city, over the years that’s what happened. But because of this lack of clarity, authorities have become emboldened over the years to do as they wish without reference to the law. And from one perspective, you can understand why. Power abhors a vacuum. As the Soviet state collapsed, it was the people who simply took charge and started running the economy were the ones who set the rules. And as they did, the ability of the law to reign them in, got weaker and weaker. ELENA: So, this situation is definitely getting worse. I think in the past, it was enough to present a law to state that it is illegal to construct something. And then the construction stopped. But now, the government uses force and saying that it is illegal is not enough to stop it. HOST: So what do you do when the opponent who doesn’t obey the rules is your government? While the construction companies were private, the Mayor’s construction boom was very much a government thing, complete with a tick of approval from the Kremlin. ELENA: Corruption is involved also. So even, even when people go to street protests and say what you are doing is illegal, it, it doesn’t work because police don’t help. And government do not respond to it. HOST: Yaroslav Nikinten also lived near Julia’s park, and decided to get involved in the fight with Julia. But Yaroslav wasn’t just any resident. He was an experienced social activist. Yaroslav decided to get involved personally to help save the park, especially since the reason for the construction seemed so openly craven to him. YAROSLAV: Because the land around parks, it’s very expensive and they just want to construct and they don’t care about the future or they just don’t associate the future with this country and with this city. They just do want, they just want to make quick money here. HOST: In other words, the people who have the power don’t have to live with the consequences of their actions. And they were there to make a buck, like any good oligarch would. YAROSLAV: Cause we have fewer and fewer green areas in Moscow. And the centre of Moscow is just…some…just a concrete place. And there are very few trees there. And in the centre, it’s not only about air but there are many psychological diseases in the centre of Moscow because of lack of trees, because of huge number of automobiles. And this is awful. HOST: So how do they do it? How do they get away with it? For a start, they kept it out of the press. YAROSLAV: For example, in the northwest of Moscow there were absolutely no publications about our fight to save our Park. We call it self-censored. In official media. HOST: That’s why the Facebook group became so important. INTERVIEWER: So, how do people find out if their park or green space is under threat? YAROSLAV: These are mostly local activists who just watch Facebook and see news, get news from there. HOST: Of course, it’s not just the media. The political leadership also play a role. There again, Yaroslav, says, there is a problem. INTERVIEWER: Why do you think the mayor didn’t care? YAROSLAV: He’s pretty confident. If he had no administrative resource, If he- if we had fair elections, I think he would care. But he just, he even said nothing. We had, we had no reaction from him. There is just censorship on his media resources and all that. HOST: So they Just. Ignore. You. Yaroslav says the only thing standing between the mayor and the construction were the courts. There again, was a problem. YAROSLAV: We have quite corrupt courts who are always on the side of power. Not always but in most cases. And there are practically no other means to change anything. So we only have public pressure. HOST: Yaroslov and Julia had generated public pressure, and eventually one institution – an environmental court – ruled in their favour. JULIA: It confirmed that the area was cemented illegally, that the vehicles had their passes illegally and the construction was illegal too. HOST: It was a victory, of sorts, but it was too little, too late. Parts of the park had already been concreted over. The trees will take decades to grow back. HOST: The residents still had some of their open space – even if their park was cast in the shadow of an apartment. And the calculus had changed: the Mayor and his construction company friends now knew they couldn’t just barrel into parks with impunity. Up until this point, they’d relied on a compliant media that kept the project out of the spotlight. But now Julia was shining a spotlight on it, it became too risky. The developers and Mayor were no longer able to act unilaterally: they had to take into account the actions of the locals. HOST: The reaction from the government was swift. In late 2016, the Mayor announced a new, breathtakingly audacious approach to stamp out the protests. YAROSLAV: In the end of 2016, Moscow city Duma, like a parliament, they prohibited municipal deputies to…gather with their voters. YAROSLAV: Yes. It was pretty terrible. And I think we should organize, unite and…fight for our rights and fight for local self-governments. HOST: That’s right. Local representatives are now banned from turning up to protests. It’s clear that somebody has a deep incentive to keep the construction boom on track. But Yaroslav says the corruption is not about under the table payments in brown paper bags. In Putin’s Russia, it runs far deeper than that. YAROSLAV:I would say that construction companies are government. There is no bribery. INTERVIEWER: They make a bid, yeah? YAROSLAV: So they initially make such bids that their own companies, I mean connected companies, they will give them, they will receive this. All rich people in Russia, they are…they are all pretty connected to government. That’s why it’s one command of oligarchs who rule the country and Moscow as well. HOST: So the fact that Julia, and Yaroslav managed to stop the construction and sort of save their park was a remarkable victory. Dogged persistence by the protesters changed the political calculations about whether stealing public parkland was worth it. It was shining too much of a light on a questionable activity. Moscow officials and their crony construction companies had to take the annoying protesters into account. HOST: Okay, so, remarkably, Julia and Yaroslav had saved their park. But by now, they’d realised that their fight wasn’t just about one park. It was a systemic problem that had been going on for years. But what exactly was going on? That’s when they met Sergey Menjeritsky (Men-jiri-sky). Sergey had been spent the last 7 years trying to answer the same question. SERGEY MENJ:After 2009, I was absolutely…I supported Mr. Putin and current government absolutely. I was pro-Putin. So I grew up in a family full of people from army, and military-oriented people. My brother is now in the army and all my predecessors were there in the Soviet times and under the Russian tsars and all this. HOST: But for Sergey, everything changed in 2009. SERGEY: At that time I went to the Russian coast of the Black Sea near Gelendzhik, one of the more favourite places.Gelendzhik is a unique place because there are forests of pines there. And this is a special type of pines that covers only 1200 hectares all over the world It’s really unique. HOST: It had special significance for Sergey. SERGEY: For me, from my childhood, this place was like a heaven on earth because I enjoyed walking along the sea near this pine forest. And this is a really beautiful place. I loved it so much. SERGEY: I went there and I saw a fence. And I saw no end of this fence. So it was like a bad dream because I went to my favourite forest but I saw a fence and guards with dogs walking nearby. And it was a fence between sea line and forest. HOST: The coastline, the beach and the forest had all been privatised. Enraged, Sergey found a gap in the fence and went through. SERGEY: I saw thousands of unique pines destroyed. I saw area prepared for construction, for construction of a palace. HOST: A distillery to produce wine and alcohol had also been built. The forest and the construction site were on protected land. Sergey wrote to the government and they confirmed that the land was essentially like a national park – something for everyone to enjoy. And yet there were fences and guard dogs. SERGEY: So I consider this a crime, a crime not only against ecology, but against all people and all humankind. I consider it in this way. HOST: Vladimir Putin. It was a done deal. Regardless of whether it was legal, with Putin’s backing there was nothing anyone could do. SERGEY: So Alec Berov who is head of the local organization, he arranged a fence there of 4 metres high. He put guards near the fence, so now it’s like his own property. His home, his family spend time there. He puts there statues and everything. And all this…Well, we don’t have a lot of beaches here. SERGEY: So Russia is quite a cold country. And here are coastlines and beaches where you can spend time in summer is a unique resource. And…it has always been protected by the government. So what happened now with the privatization of the past unique natural reserves has no parallels in the history of Russia. It’s unbelievable. HOST: To Sergey, this raised fundamental questions. SERGEY: So after my research, I started thinking. What is our government and how could I communicate with it? So the government should help people solve issues but this, this situation was the opposite like the government created the issues. HOST: For Sergey, all roads led to the people behind the scheme. Which included some familiar faces. SERGEY: Everyone knows the current mayor of Moscow, Sobyanin, and Alec Beroff who’s head of [38.30] Lukoil Corporation there, are friends. Some time ago, Sobyanin was mayor of Kogalym, its region was central for oil business. So it is the same scenario each and every time. If you are in government or a friend of government, you can go illegal. HOST:So Sobyanin came to power as Mayor of Moscow. He had a lot of business links to an oil rich region. But then in 2012, the US passed the Magnitsky Act. Yep. You might have heard of it. The law that sanctioned Russian oligarchs and drove Putin to support Trump in the 2016 election. Before the Magnitsky Act, the Russia’s gas and oil magnates, would make their fortunes and then move their families and their fortunes to London or Monaco or Malta. ELENA: So such representatives of the government get the resources and then move to foreign democratic well countries. And they had no obstacles to do it. HOST: But after the Magnitsky Act, corrupt oligarchs — Putin’s support base — had nowhere to go, and nowhere offshore to put their money. Western banks were forbidden from touching it. It was a real problem for them. And a real headache for Putin. Suddenly the whole reason the oligarchs supported him had disappeared. Suddenly, Sobyanin’s plans for Moscow seemed like the perfect business opportunity, and a perfect way for the Kremlin to keep their favoured oligarchs with plenty of profit making ventures on their hands. It was domestic, it was funded by the government – which was a fairly limitless resource of money, and best of all, it was being run by their old mate: Moscow Mayor Sergei Sobyanin. HOST: In other words, if the government had truly wanted to do something about improving housing for 1.6 million people, they would have actually talked to residents about what they wanted. Instead, they brought in construction companies and gave them carte blanche. It suggested that serving the interests of the construction oligarchs was the true aim of the policy. So in stopping construction on their park, Julia and Yaroslav had found themselves taking on powerful forces. They were taking on the entire Russian establishment. This wasn’t just about a park, this was about the future of the city, and who got to decide what it looked like: the residents or the billionaires. To win, it seemed obvious that they needed to broaden their front. They’d heard about other protests, in other parts of Moscow. Someone had even set up a Facebook page to keep track of it all, but each group was isolated. Each group was fighting the same fight, against the same opponent, but not coordinating amongst each other. Vasily Yablokov was the coordinator of Urban Project at Greenpeace Russia, and also, conveniently the head of Research. Yaroslav had a chat to Vassily about the problem. The thing is, this was not usually the sort of battle that Greenpeace would get involved in. VASILY: It’s very local and very small. And Greenpeace don’t…doesn’t have a position, a strong position about local problems. HOST: Usually Greenpeace works on big, international problems, but Vasily had a very pragmatic approach. Many of Greenpeace’s potential volunteers were affected by the Mayor’s plan. VASILY: Our people who can be our potential supporters live in the cities and we should work if their local reality…because we…we need people. Because we’re people power organization. HOST: Vassily also had skin in the game. The government wanted to build a freeway through his local park, so he politicising these battles could be. He decided to tear up the Greenpeace rule book. The other side weren’t playing by the rule book anyway. VASSILY: Now it’s our position that Greenpeace can work with all local problems. And we should rise activism in the cities. HOST: They decided they needed to form a network of all the small protest groups. But before they could do that, they needed to get a handle on what the hell was going on. Which projects were legal? Under Moscow’s planning laws, you can’t just build apartment blocks without also building the necessary schools, hospitals, shops and roads. This was something the Mayor had completely neglected. VASSILY: We found a lot of illegal points of this project. HOST: Yulia Galamania was a well known local activist in a different part of Moscow. YULIA: So in March 2016, Greenpeace together with human rights institution organized a research into the problem and created a report on it. So at that time and before, the problem was understood. HOST: As part of the research, they spoke to the designers and the lawyers and suggested changes to the Mayor’s plans. But nothing happened. Vassily says that’s because in the political theatre the technocrats working on the plan were guileless to the broader political context. VASSILY: This people have the role of stupid people who don’t understand anything. HOST: Sergey Menjeritsky helped out, running a website called Open Coast. Initially it was just to monitor the illegal sales of coastal property, but has since blossomed into a registry of all the illegal sales of land. SERGEY: It’s like a register on my website. It’s like a map of so-called stolen coastlines of Russia. And any citizen of Russia can go to my website and put a point on the map if he or she thinks this part of coastline is stolen. INTERVIEWER: Does it include any sites or sales inside of Moscow? SERGEY: Yeah, it includes Moscow. And there are a lot of illegal activities which is pointed there which took place previous. Yeah, I mentioned some examples. INTERVIEWER:Is this, is this one way that many Muscovites can find out about illegal sales? SERGEY:Yeah. I have a lot of other helpful resources on my site, not only the map itself, but also guidelines and instructions on how to act when you see a fence on coastline. So first, people who see they are shocked, they are angry. But if they go to my website they can see how they should act. INTERVIEWER: So in my country, the government provides the information that you provide. Why doesn’t the government provide this information? SERGEY: The fact that government do not provide such information proves that the government is corrupted and works for its own interest, not for interests supporting their people. So the head of Land Titles Office does not do such a register of occupied coastlines. They should do it but they don’t. HOST: In effect, they were answering the problem that lay at the heart of their strategic dilemma: if the government wasn’t going to behave like a government, and follow the rules, the protesters would start writing their own rules. They would keep track of the records, they would be the reliable source of legitimate information. They were filling the vacuum of legitimate government. SERGEY MENJ: So people are far away from all the mechanisms that works for decision making. And it is hard to fight against it. So, actually, Putin’s system is called the system of decorative democracy. HOST: The protesters role was to bring decision making within the reach of those it affected. The residents of Moscow. HOST: Thanks to the report, and several local green space victories, for the first time, the mainstream media were paying more attention. It was clear these people were not shabby radicals but a reliable source of information in the face of a slippery administration. VASSILY: it was, it was very cool because we used media like a pressure for…government. HOST: And thanks to Vassily’s network coordinating local groups, the protests started getting bigger. Suddenly it was part of the national politics in Russia, thanks to Greenpeace Executive Director Sergey Tsyplenkov. —Okay, I asked mayor of Moscow about the situation. HOST: Putin was shocked. But surprise, surprise nothing changed. The Mayor kept going, demolishing parks all around Moscow, all but confirming which side Putin was on. HOST: Then, in February 2017, just as winter was at its most bitter, the Mayor announced his boldest plan yet: 50,000 apartments would be razed to the ground as phase one of a massive so-called “renovation”. That’s 7900 apartment blocks. HOST: Ironically, in a way, this was exactly the sort of overreach that the protesters needed. Now it wasn’t just your park that was being threatened with illegal demolition. It was your home. The pace of organising picked up speed. Step one. Petitions. Yulia Galamania – who had previously run for office – knew how to organise. YULIA:So there are about 30 houses per block of flats in the district where I live. And in a week, we gathered about one thousand signatures. YULIA: So after that, when we got connected to people, we found one or two activists in each house in our district. HOST: They were organising at a hyper-local level. But they couldn’t just play locally on an issue that was affecting the whole city. They had to go broad as well. ELENA: Muscovits Against Destruction of Buildings. So this group probably has about 30,000 followers but it’s not only one group. HOST: To build on the momentum, they decided to hold a meeting in Pushkin Square. The idea was to show that they were not a fringe group, but a major political force. 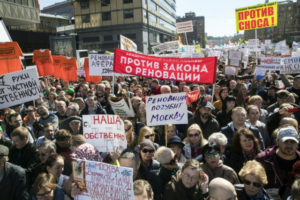 Through coordination of all the local protest groups on 14 May, 60,000 people across Russia protested, the largest in five years. HOST: In the footage, heavily armed anti-riot police use batons to pull down protest placards attached to a statue in the square. YULIA: Go near this scene of this meeting and he started to have some quarrels with police. Police tried to arrest him. HOST: Remarkably and rapidly, the rally had an effect. The protest march was in mid-May. By the end of the month, the Mayor had massively scaled back his ambitions, halving the number of apartment blocks scheduled for demolition. INTERVIEWER: And what kind of message do you think the rally sent to the mayor about renovations and about the changes to green spaces? JULIA: So it’s really hard but anyway, it was worth it if before that you had only 60 days to relocate if your home is to be renovated, now you have 90 days. And it’s something. HOST: It’s something because it allows protesters extra time to organise to stop demolitions. You see, if you can get 70% of your building to oppose the demolition, you can now veto it. This change in the law gave people like Julia the space she needed to stop the demolition of her apartment block. Beyond that, it shows that the protesters had achieved some recognition in one of the hardest sites for protest in the world. The rally made the Mayor realise that he must take the people into account. Not only that, but one poll conducted after the protest said 58% of Moscovites supported the protest. Which greatly undermines the Mayor’s claim that 80% of people support the demolitions. HOST: The fight is far from over. Some distant observers see echoes of the 2012 protest movement in this latest surge. Back then, 120,000 filed onto the streets of Moscow in the wake of a national election that was decorative democracy at its finest. But there are key differences to this protest movement. For a start, it is grounded by very specific local concerns. Many of those involved are not there out of some political ambition, but simply out of a desire to protect their homes, and whose eyes have now been opened to the flagrant corruption of the system. INTERVIEWER: How has this campaign, all this work changed how you think about the government? JULIA: So my opinion of the government, it turned upside-down. And I understood that all power is in the hands of rich people. Only they can decide what is next in our country. HOST: So what would you do if you were them? Here, the protesters themselves are divided. Some, like Julia Robanova decided that the only way to force accountability on the Moscow Duma was to join it. She decided to run in the local elections. After all, as Yaroslav points out, most of the local campaigns still lose to those in power. Perhaps they’ll have more impact if they have someone representing them from within. YAROSLAV: Most of campaigns are being lost. But if we lose, we can win in elections, for example. It, it could be a good outcome from this. HOST: And Yulia Galamania believes that only by participating can democracy become less rigged. YULIA: In the past, people considered all elections in the government as [1.27.36] elections, rigged elections and so they didn’t participate, they didn’t participate in it at all. So the world will not change by itself. You need to do something to make change to the world. HOST: Others, like Sergey and Vassily believe that acting outside the political system will bear more fruit. Sergey’s website will continue to be the definitive register of illegal land sales in Moscow, and Vassily coordination of local groups will ensure that protesters can bring city-wide scale to local concerns. In sticking with his approach of simply doing the government’s work for it, Sergey is expanding the concept of a local boards, which are like standing citizen committees that keep pressure on the local deputies, and provide them with truthful information. SERGEY: So when we create a normal independent local board, is, we can get this brain and, or these mechanisms of communication with the whole living organism. And in that case the government at the city level will get proper information about what is going on in the districts. Because now they have signals only from the high levels of power. HOST: Every state has a power dynamic where the people can play a role. Even in Russia where the government has a track record of literally killing its opponents. This social movement was particularly effective because it was based on the day to day experiences of Muscovites. It was first based on their love of their treasured green spaces and their attachment to their homes. It was grounded in place – in the spaces that people live in every day. It meant that everyday people, people who had never been involved in political life, felt comfortable stepping into political action. And the process of being political – of contesting power – taught them so much about how the system worked. They learnt the force they were up against when the environmental organisation sided with the construction company. They were taught about real politics when the apartment block was built despite it being illegal. These moments provided those involved with lessons about how the Russian state worked. Then the state over-reached with its the decision to demolish tens of thousands of homes. This then caused an equal and opposite reaction by the people – that forced this decorative democracy to compromise. These change makers haven’t won in Moscow, but they haven’t lost either. The most important lessons they have gained is they have learnt how to fight.